Hear ye!! Hear ye! The latest installment of the Anastasia Pollack Crafting Mystery has arrived! I am so excited to read this book! I absolutely love this series. The main characters are hilarious, the plot lines fun, and in general just a great, great, great series!!! If you haven’t read any books in this series, get your hands on them, grab yourself a cup of coffee or tea and get reading! Synopsis (from bn.com): In this fourth installment of the Anastasia Pollack Crafting Mystery series, Anastasia and her fellow American Woman editors are steaming mad when minutes before the opening of a consumer show, they discover half their booth usurped by Bling!, their publisher’s newest magazine. CEO Alfred Gruenwald is sporting new arm candy-rapper-turned-entrepreneur and Bling! executive editor, the first-name-only Philomena. During the consumer show, Gruenwald’s wife serves Philomena with an alienation of affection lawsuit, but Philomena doesn’t live long enough to make an appearance in court. She’s found dead days later, stuffed in the shipping case that held Anastasia’s decoupage crafts. When Gruenwald makes cash-strapped Anastasia an offer she can’t refuse, she wonders, does he really want to find Philomena’s killer or is he harboring a hidden agenda? My thoughts: I truly, truly enjoyed this fourth book the Anastasia Pollack Crafting Mystery. What a great cozy mystery series. One of the reasons this series stands out for me as a great one is the absolutely great cast of characters. Every single character in these books are awesomely quirky and downright hilarious. This series is a true laugh out loud read! Great! Now that being said, just a tad of what I didn’t love about this particular book. I for one felt that the end was really abrupt and just came to a quick conclusion in like a page. Boom . . . it was all done! WHAT??!? There is a nice cliffhanger however that of course will keep me reading . . .
Anxiously awaiting the next one in the series. A wonderful, light, laugh out loud cozy series that should be on every cozy lover’s list! Synopsis (from bn.com): Anastasia Pollack’s dead louse of a spouse has left her with more bills than you can shake a crochet hook at, and teaching craft classes at her mother-in-law’s assisted living center seems like a harmless way to supplement her meager income. But when Lyndella Wegner—a 98-year-old know-it-all with a penchant for ruffles and lace—is murdered, Anastasia’s cantankerous mother-in-law becomes the prime suspect. Upon discovering that Lyndella’s X-rated craft projects—and her scandalous behavior—made her plenty of enemies, Anastasia sets out to find the real killer before her mother-in-law ends up behind bars. 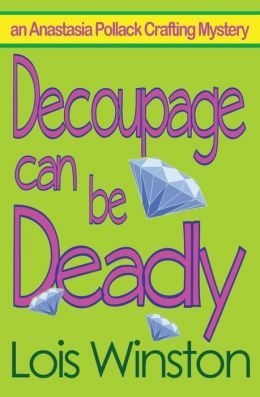 My thoughts: What a delightful book in what I think is just a delightful cozy mystery series. I have really enjoyed every book in the Anastasia Pollack Crafting Mystery series and this latest book was no exception. I love the main character, Anastasia, craft editor at American Woman magazine, and a woman just trying to manage her crazy, hectic life since her “Louse of a Spouse” dropped dead in Las Vegas while gambling away all of their money. There are always parts of these books that are simply laugh out loud funny, which I LOVE! I think Anastasia and her cast of characters including her mother, her commie mother in law, her two sons, and her hunky tenant are simply fun, witty, and charming. I love them all and can’t wait to see what is going to happen next. This book had the perfect balance of everything for me without seeming too “cheesy” as some cozies can get. There was a great balance between trying to solve the mystery of the death of her mother-in-law’s rehab roommate with a mysterious past, getting to know the characters more, a little crafting knowledge, and just plain a great, fun story! I truly enjoy this great series and highly suggest you give it a try if you want to give yourself a good, light, cozy mystery! This series would be perfect to grab for a summer afternoon by the pool or a great beach read! When Anastasia Pollack’s husband permanently cashes in his chips at a roulette table in Vegas, her comfortable middle-class life is suddenly kaput. She’s left with two teenage sons, a mountain of debt, and her hateful, cane-wielding Communist motherin-law. Not to mention stunned disbelief over her late husband’s secret gambling addiction, and the loan shark who’s demanding fifty thousand dollars. Anastasia’s job as crafts editor for a magazine proves no respite when she discovers a dead body glued to her office chair. The victim, fashion editor Marlys Vandenburg, collected enemies and ex-lovers like Jimmy Choos on her ruthless climb to editor-in-chief.But when evidence surfaces of an illicit affair between Marlys and Anastasia’s husband, Anastasia becomes the number one suspect. My thoughts: I LOVE, LOVE, LOVE the main character in this book, Anastasia Pollack. She is smart, witty, and just plain hilarious! This is a great first book in a new cozy series and I can’t wait to start book #2. The main character really makes this book and I want to find out what trouble she is going to get into in the second book. Anastasia’s character kind of reminds me of Kiki Lowenstein in Joanna Campell Slam’s Scrapbooking mysteries for any of you who have read those. I can’t say enough about this book. 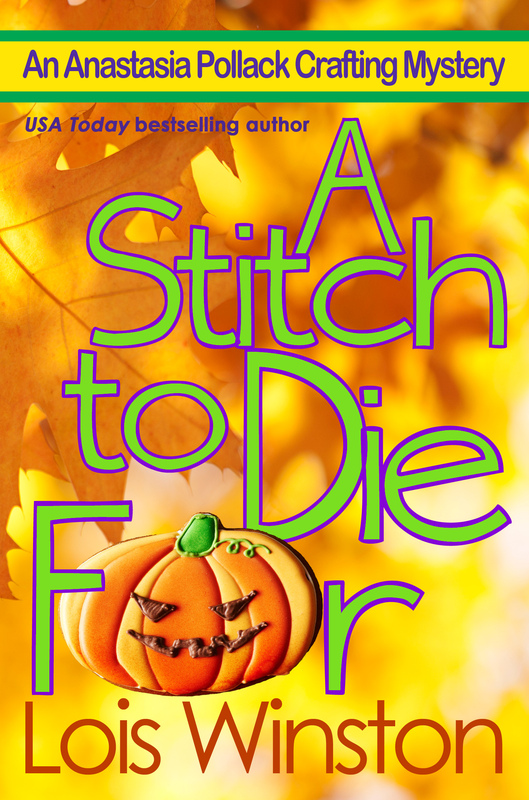 If you are looking for a fast cozy mystery that will keep you laughing all the way through, look no further. I for one hope that there will be MANY more in The Anastasia Pollack Crafting Mystery series. HILARIOUS! The second book in this series is out now: “Mop Doll Murders”.